How can I improve my reputation at Gengo? The anonymity and size of Gengo’s translator community may make you feel like it’s impossible to be recognized and rewarded for good performance. In fact, there are a number of ways that you can develop your reputation within Gengo. Your dashboard features a personalized scorecard showing your performance as a Gengo translator. The scorecard focuses on quality, and also provides a summary of your work history at Gengo. The quality metric is the average of your GoCheck scores from reviews by Language Specialists. This is the most important indicator of your performance at Gengo. When a customer approves a translation, they will be given the option to rate their experience (out of 5) regarding translation quality and provide a comment. 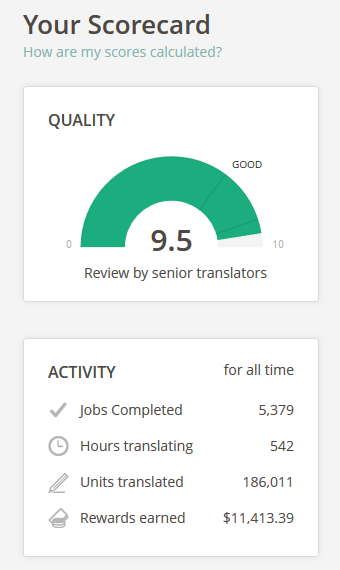 This rating doesn't affect your average score, but if your translation receives a quality rating of 2 or lower, the job will be flagged for Language Specialist review. As we are a crowdsourced service, there is no way for customers to assign their translation to a specific translator. We do, however, allow customers to create a list of preferred translators and give them priority access to their jobs. At Gengo, we place a high value on attitude. We are constantly monitoring our forums, translator-customer interactions and customer feedback, and are always pleased when we notice translators with friendly, helpful attitudes. If you are someone has a good attitude or goes out of your way to satisfy your customer, you are more likely to be recommended for important projects or put forward for Language Specialist positions. If you use impolite language or engage in disruptive behavior (such as locking off jobs, submitting incomplete drafts to meet the deadline, creating multiple accounts to avoid a negative review, etc.) you risk removal of qualifications or permanent suspension. For more information about your obligations as a Gengo translator, please refer to your Translator Agreement.